I have made mummy bentos previously, but instead of using thin strips of cheese as I did before for the bandages, I tried something a bit different this time. I used tortilla to make some roll-ups and then cut another into thin strips to make the bandages. I found that it helps to stick them in place at the ends with just a tiny dab of honey or some other sticky condiments. With the candy eyes added they look as surprised as Nikolai might be. :) This lunch is packed in his Laptop Lunches. 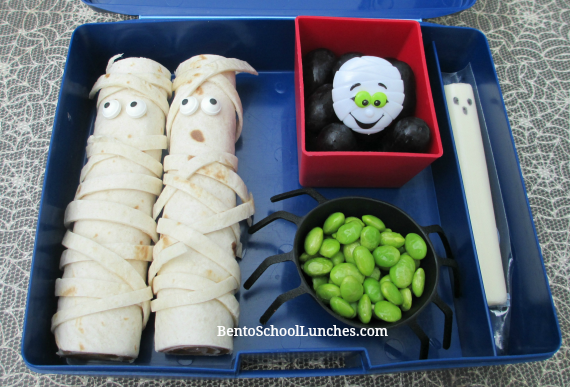 A couple of Mummy tortilla roll-ups with candy eyes. Top right: Seedless black grapes with a cute Mummy cupcake ring. Bottom right: Edamame (Eat-a-mummy?) in a spider silicone cup. Far right: Mozzarella string cheese, I used food safe marker for the facial details. So creative, Rina! I love these tortillas version, their expression looks so funny.